The stakes are high for Nordstream 2—Russia’s proposed $10 billion gas pipeline to Germany. If completed, the project will become more than a conduit for Kremlin energy exports. It will divide Europe, isolate Central Europe and Ukraine, and fortify Russia’s corporate and political allies across the continent. Recognizing Moscow’s use—and abuse—of information elsewhere in the West, it is little surprise that Nordstream 2 has become the subject of an effective multi-dimensional, multi-state disinformation campaign in its own right. This campaign may well now be poised to succeed, despite the damage Nordstream does to EU supply security, EU market liberalization principles and European solidarity. Probably the only compelling threat now to Nordstream 2 is the prospect of a legal challenge in the EU courts. Only, what are the facts of the case? Claim 1: Nordstream 2 is purely a commercial project. To think of NS2 purely as a commercial project, one has to ignore the fact that the Russian state is a majority shareholder of Gazprom—which is Nordstream’s owner. Russia is at war with Ukraine, and indeed has illegally annexed part of its territory; construction of the pipeline will further undermine Ukraine. With Nordstream 2 bypassing Ukraine, that country will lose $2 billion in energy transit fees, close to 10 percent of its annual budget. More worrying still is that Ukraine now relies on non-Gazprom directly sourced gas by buying from states in Central and Eastern Europe (CEE) that receive gas along the Ukrainian and Polish transit routes. Once Nordstream 2 is up and running, most natural gas will flow from West to East through pipelines controlled by Gazprom or its allies—making it more difficult and expensive for Ukraine to obtain gas not directly sourced from Gazprom. Seeing this project solely as a commercial one also ignores the geopolitical reality that it severely divides the EU. Most of the Baltic states and those of CEE are wholly opposed. Promoting NS2 divides these states from those of Western Europe, and principally among Western European states, Germany. As this would greatly advantage Russia, meaning that the project is as much geopolitical as commercial. Claim 2: Since gas production in Europe is declining, the EU needs more Russian gas. A further argument deployed by Nordstream 2 and its allies is to say the EU needs NS2 because its gas production is falling. It is true that British and Dutch North Sea gas production is on the decline. However, Nordstream 2 won’t replace it, because NS2 is a diversionary pipeline—not a source of new supply. All NS2 is going to do, just like Nordstream 1, is replace natural gas that transits through Ukraine with natural gas that now transits via the Nordstream pipeline system. Claim 3: Nordstream 2 promotes EU energy liberalization. One just has to stand back a little and consider the economic realities of this claim. Letting Gazprom use Nordstream 2 to bring more gas into the heart of Europe will further increase its market power in Germany and Central Europe. What’s more, it will reduce investment incentives to build new pipelines and obtain new sources of supply in CEE states, further locking in Gazprom’s dominance. NS2 is not a pro-liberalization measure. The anti-liberalization effect of the Nordstream pipeline stems in significant part from the Gazprom export monopoly. 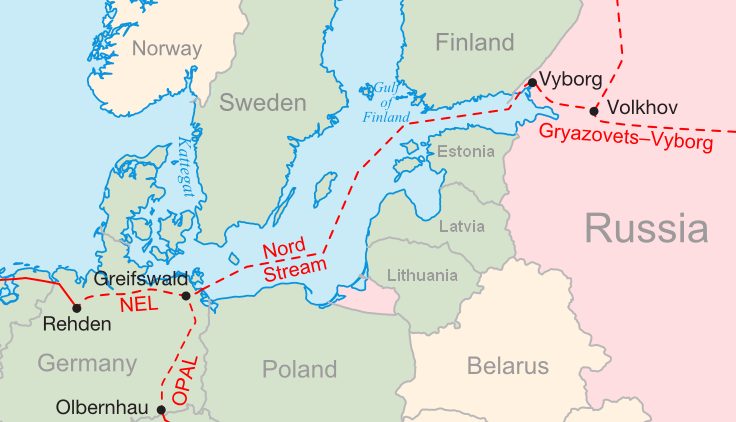 Gazprom monopoly gas flows into the Greifswald pipeline. As a consequence, all of the beneficial operating procedures of liberalization, third-party access, tariff regulation and the auction system are undermined. This can be demonstrated with the recent proposal to amend Nordstream 1’s connecting pipeline OPAL. The EU Commission’s exemption decision had the effect of increasing the amount of gas that could go through the pipeline. At first sight, this looked like a liberalizing measure, since the new capacity would be auctioned. But as only Gazprom gas could flow through the main entry point at Greifswald, the auctions would in fact be dominated by one supplier: Gazprom. Claim 4: Applying the Energy Union principles is “political.” In 2014, the EU established its Energy Union policy, which emphasized the importance of supply security, particularly in relation to gas. That policy focused on the importance of diversifying routes and supply sources. NS2 concentrates supply on one route and makes the EU more dependent on one supplier. Gazprom allies, supporters and lobbyists have attacked the Energy Union as “political” and that its policies should not interfere in applying the EU’s liberalization rules. This is despite the fact that EU rules expressly refer to the importance of supply security, and policies such as the Energy Union are supposed to influence the decision-making process. Claim 5: Russian is a reliable energy supplier. It is true that since 1967, Russian gas has flowed uninterrupted in Western Europe, save for the 2006 and 2009 crises. However, viewing Russia as a reliable energy supplier ignores the way Russia has treated CEE and the Baltic states. As R. L. Larssonpoints out in his major work on this issue for the Swedish Defense Research Agency—“Russia’s Energy Policy: Security Dimensions and Russia’s Reliability as an Energy Supplier”—Russia enacted at least 40 politically motivated energy cutoffs across the region between 1991 and 2004. Even more recently, Gazprom has threatened Hungary, Poland and Slovakia that it would cut gas flows to those countries if they supplied Ukraine. Between November 2014 and March 2015, it carried out those cutoffs. Claim 6: Ukraine is an unreliable energy supplier. It is something of a stretch for Gazprom and its Western corporate allies to argue that Ukraine is an unreliable energy supplier when, as explained above, Gazprom has actually being recently cutting gas flows to EU Member States. The claim of Ukrainian unreliability which underpins this argument for Nordstream 2 overlooks not only Russian unreliability, but the fact that since 2009 transit of gas flows across Ukraine have been stable. Despite, invasion, annexation, and significant economic and political turmoil the gas has get flowing across Ukraine. Furthermore, Ukraine has joined the Energy Community, pledged itself to comply with EU energy liberalisation rules, and has begun seeking full compliance with those rules. Over the last decade it is Russia that has proved to be the unreliable energy supplier—not Ukraine. Claim 7: Ukraine has made transit fees very expensive for Nordstream 2. This is the second string of the Ukrainian unreliability argument—that the terrible (and greedy) Ukrainians have raised the cost of pumping gas across Ukraine, making Nordstream 2 a cheaper option to get gas to Europe. This charge overlooks two salient points. First is that Ukraine increased transit fees for Russian gas only after Russian President Vladimir Putin announced that Russia would not use the Ukrainian transit system to move gas into Europe after 2019. The Ukrainians therefore raised costs to reflect the fact that the pipelines would not be used after 2019. Instead of recovering existing capital and transit costs over another decade or so those costs would be recovered by 2019—hence the significant tariff increase. Second, it also follows that after 2019 the cost of transit will be much lower than before the recent tariff increases, as all capital costs will have been paid off. In fact, Ukraine has made its transit route much cheaper and more competitive against Nordstream 2 when it is due to begin operating in the early 2020s. Will the disinformation campaign in support of Nordstream 2 prevail? It should be clear what’s at stake here. If Nordstream 2 is built, at the very least the EU’s Energy Union will be difficult to sustain. The union’s underlying principle is solidarity, and EU institutions—as well as Germany—will have demonstrated little solidarity with the CEE and the Baltic states. Nordstream’s successful development would do further damage to the EU’s integrity. Post-Brexit, one would have thought that the EU would make solidarity a priority—or at the least avoid measures that would divide Member States. Yet Nordstream 2 will put further strains on the EU—on top of Brexit—undermining its capacity to act as well as its longer-term capacity to survive. AUTHOR: Dr. Alan Riley is a Senior Fellow at the Institute for Statecraft in London. Dr. Riley is also an adviser to PGNiG and Naftogaz. The article was originally published by the Center for European Policy Analysis, CEPA. All opinions are those of the author and do not necessarily represent the position or views of CEPA.